During 2007 and 2008, soil samples of wheat and barley fields of the cold regions of the Kohgiluyeh and Boyer-Ahmad province were surveyed for cereal cyst nematode. In 65% of samples cysts were seen. Morphological and morphometrics of cysts, cone top structure and second stage juveniles of the isolated populations were studied. Detailed taxonomic studies revealed the existence of H. filipjevi. This is the first report of the species in the province. Mohammad Abdollahi , 2008. Morphology and Morphometrics of Heterodera filipjevi (Madzhidov, 1981) Steller, 1984 From Kohgiluyeh and Boyer-Ahmad Province, Iran. Pakistan Journal of Biological Sciences, 11: 1864-1867. Cereals, such as wheat, oats and barley, are among the major staple crops of economic importance worldwide. These crops are parasitized by many pathogens and pests including plant parasitic nematodes. Among nematodes, cyst-forming nematodes (Heterodera spp.) are considered to be very damaging because of crop losses they induce and their worldwide distribution. Currently, the genus Heterodera contains more than 60 species. The cereal cyst nematodes, Heterodera spp., are major pests of cereal crops and their worldwide occurrence has been known for many years (Greco et al., 2002). Wheat is the major field crop in Kohgiluye and Boyer-Ahmad province with 282 thousand metric ton produced annually on 205 thousand ha (MJA, 2008). A survey of cereal cyst nematodes carried out in cereal fields of the Kohgiluye and Boyer-Ahmad province to clarify the presence of the any cyst nematode in these fields. Based on comparative morphological and morphometrical studies on cysts and second-stage juveniles, the collected populations were identified and the results are demonstrated in this study. During the course of investigation to survey the occurrence of cereal cyst nematode in the cold regions of the Kohgiluyeh and Boyer-Ahmad province, soil samples (500 g) were collected from the rhizosphere of wheat and barley of several fields of seven wheat and barley growing districts namely Yasouj, Pataveh, Kakan, Tang-e-Sorkh, Chitab, Sepidar and Dasht-e-Rome, 15 days before harvest (Fig. 1). The soil samples were processed using Cobb`s sieving technique (Cobb, 1918). Twenty and 100 mesh sieves were used for washing the soil. The cysts were collected and then processed as follows for detailed morphological studies. The cone tops of cysts were mounted in Canada balsam (Kornobis, 1976). Few mature cysts from each population were placed in fresh water and the second stage juveniles (J2s) were allowed to emerge. After about a week the J2s were picked from the suspension and concentrated. The concentrated suspensions were killed in hot water bath and fixed in 2% formaldehyde. J2s were picked from the respective fixed nematode suspensions. Fixed juveniles were processed in glycerin and their permanent mounts were prepared in dehydrated glycerin. Cyst, cone top structure and J2s morphometric means including cyst length, cyst width, cyst length to cyst width ratio, vulval slit length, length of fenestra, breadth of fenestra, fenestral length to fenestral breadth ratio, vulval bridge length, vulval bridge breadth, under bridge length, under bridge breadth, J2s body length, maximum body width, a ratio, distance from head to oesophageal gland lobe, b ratio, stylet length, tail length, C ratio and hyaline tail length were measured using the compound research microscope, Sa Iran, having a drawing tube attachment (Table 1 and 2, Fig. 2). Morphological and morphometrical studies on the populations showed that cyst and juvenile characters closely agree with those of H. filipjevi from Tadzikistan. Measurements of cysts and second stage juveniles are presented in Table 1 and 2. The second stage juvenile body length varies between 490-570 μm and width is 20-23 μm. The stylet is robust and measures 22-25 μm with moderately concave knobs. Cysts are lemon-shaped, partially transparent, light brown in color and having ridges running in zigzag patterns. The cyst length and width are 520-880 and 350-650 μm, respectively. The vulval cone is bifenestrate with an underbridge varies 65-91 μm in length and 6-10 μm in width. The H. avenae group contains 12 valid cyst-forming species with the pronounced vulval cone, a bifenestrate configuration of the vulval area and a vulval slit length less than the width of the fenestrae (Handoo, 2002). 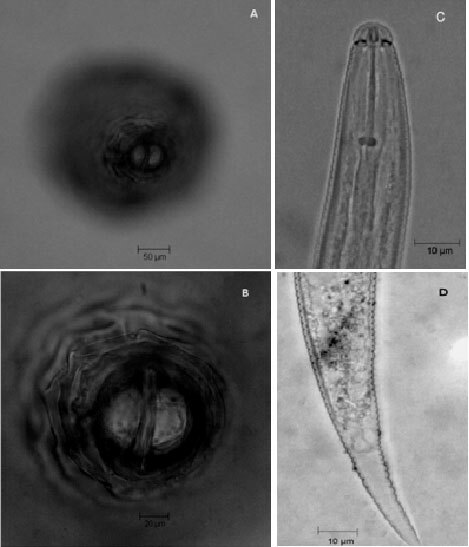 The most economically important cereal cyst nematode species damaging winter cereals are: Heterodera avenae, H. hordecalis and H. filipjevi which most often confused with H. avenae (Greco et al., 2002). The cereal cyst nematode, Heterodera avenae is the principal species on temperate cereals, while another important cereal species, H. latipons, is essentially only Mediterranean in distribution, being found in Syria, Israel, Cyprus, Turkey, Italy and Libya. However, it is also known to occur in northern Europe. Another species with an increasingly wide distribution is H. filipjevi, formerly known as Gotland strain of H. avenae. It has been found in Tadzikistan, Russia, Iran, India, Sweden and Turkey (McDonald and Nicol, 2005). In 1964 a cyst-forming nematode identified as H. avenae was found in Tadzikistan and was subsequently described as a new species, H. filipjevi, by Madzhidov (1981) on the presence of a characteristic underbridge in the cysts and differences in morphometrics of juveniles and cysts from other species. It has also demonstrated that the species is widely distributed in the former USSR and also reported from Uzbekistan, Ukraine, Bulgaria, Germany, Sweden, England, Poland, Estonia, Spain (Subbotin et al., 2003), Norway (Holgado et al., 2004a, b) and Slovak (Renco, 2005). Presence of H. avenae group in many regions of Iran has been reported by several workers (Sturhan, 1996). Sturhan (1996) has been reported the occurrence of H. filipjevi in Iran. He has been concluded that besides H. filipjevi and H. latipons, more species of the H. avenae group occur in Iran and as long as there is no evidence that the characters were used in identification of the above mentioned species, are in fact H. filipjevi. This species can be separated from other species of H. avenae group on the basis of morphology of the cyst, cone top and second stage juveniles (Handoo, 2002). Based on morphometrics of the second stage juveniles, cysts and cone top structures, the isolated populations were identified as H. filipjevi. The studies have shown that H. filipjevi is widespread in many other Mediterranean regions and it can be concluded that the main area of distribution of is in the east-European and Oriental region (Rumpenhorst et al., 1996). According to Damadzadeh and Ansaripour (2001) in 20% of samples the cysts of H. filipjevi were seen. However, complementary studies are required to survey the distribution of the species in the other regions of Iran. The research was supported by Research and Technology office of Yasouj University under grant number 1274. The author thanks for their valuable assistance. I also thank, with adoration, the reviewers, Pakistan Journal of Biological Sciences, for their valuable suggestions. Their contribution in correcting the manuscript is of immense value. Cobb, N.A., 1918. Estimating the nema population of the soil. Agricultural Technology Circular I, Bureau of Plant Industry, USDA. Damadzadeh, M. and B. Ansaripour, 2001. Identification and distribution of Heterodera filipjevi in the Esfahan area of Iran. Russian J. Nematol., 9: 57-58. Greco, N., N. Vovlas, A. Troccoli and R.N. Inserra, 2002. The mediterranean cereal cyst nematode, Heterodera latipons: A menace to cool season cereals of the United States. Florida Department of Agriculture and Conservation Services Division of Plant Industry. Nematology Circular 221. Handoo, Z.A., 2002. A key and compendium to species of the Heterodera avenae group (Nematoda: Heteroderidae). J. Nematol., 34: 250-262. Holgado, R., J.A. Rowe and C. Magnusson, 2004. Morphology of cysts and second stage juveniles of Heterodera filipjevi (Madzhidov, 1981) Stelter, 1984 from Norway. J. Nematol. Morph. Syst., 7: 77-84. Holgado, R., S. Andersson, J.A. Rowe and C. Magnusson, 2004. First record of Heterodera filipjevi (Madzhidov, 1981) Stelter, 1984 in Norway. Nematol. Med., 32: 205-211. Kornobis, S., 1976. A modified technique for mounting vulval cones of Heterodera cysts. Nematologica, 22: 227-234. MJA, 2008. Cultivation database, Bureau of statistics and information technology. Deputy of Planning and Economic Affairs, Ministry of Jahad-e-Agriculture, Iran. .
Madzhidov, A.R., 1981. Bidera filipjevi n. sp. (Heteroderina: Tylenchida) in Tadzhikistan. Biologisheskie Nauki, 83: 40-44. McDonald, A.H. and J.M. Nicol, 2005. Nematode Parasites of Cereals. In: Plant Parasitic Nematodes in Subtropical and Tropical Agriculture, Luc, M., R.A. Sikora and J. Bridge (Eds. )., 2nd Edn. CAB International, Wallingford, UK., pp: 131-191. Renco, M., 2005. Current occurrence and geographical distribution of Heterodera avenae Wollenweber 1924 in the Slovak Republic. Plant Prot. Sci., 41: 80-85. Rumpenhorst, H.G., D. Sturhan, J.H. Elekcioglu, G. Ozturk and S. Enneli, 1996. The cereal cyst nematode Heterodera filipjevi (Mazhidov) in Turkey. Nematol. Mediterranea, 24: 135-138. Sturhan, D., 1996. Occurrence of Heterodera filipjevi (Madzhidov, 1981) Stelter, 1984 in Iran. Pak. J. Nematol., 14: 89-93. Subbotin, S.A., D. Sturhan, H.J. Rumpenhorst and M. Moens, 2003. Molecular and morphological characterisation of the Heterodera avenae complex (Tylenchida: Heteroderidae). Nematology, 5: 515-538.